That's the reporter's way of saying "finished." A "30" at the bottom of a page means "Last page." This is issue 30 of Roleplayer. And it's the last one. The new magazine will be called Pyramid. It will be a general gaming magazine, with – no surprise, I hope – a heavy emphasis on GURPS, Car Wars and our other top products. But its purpose will be to cover the best of gaming, no matter who published it. There will be articles and scenarios for Traveller, Shadowrun, Cyberpunk 2020, Runequest, CoC and other top RPGs. There will be reviews, too. We will not try to review every new release; that way lies madness. Instead, we'll offer "Pyramid Picks," in capsule form, of the very best new releases in RPGs, boardgames, miniatures and miniature rules, and even the occasional computer game. And when we see something really great, we'll write a "Wish We'd Done That" featured review. The new zine will need even more writers, reviewers and artists – on all subjects – than Roleplayer and ADQ put together. We'll create specific writer and artist guidelines soon; if you're interested, send a SASE and ask for them. We will become a market for individual freelance art submissions, just as we were in the good old Space Gamer days. However, if you're already subscribing to Roleplayer. we'll honor your complete subscription with issues of Pyramid. Unless, of course, you want your money back. We hope you'll like the new magazine even better than this one . . . bigger and better and all that . . . but if not, we'll refund the unused portion of your Roleplayer subscription any time before June 1, 1993. As this issue goes to press, lead miniatures have been banned, by summary action of the Commissioner of Health, in New York State. The stated reason translates to "Children might lick them." Speculation is rampant about the real reason why this administrator would suddenly ban, by emergency order and with no advance hearings, this one particular type of item. Both the Game Manufacturer's Association and individual miniature companies are attempting to appeal the order. Lead is a poison, yes. But we deal with dozens of dangers every day. If you don't swallow them and don't let your children swallow them, you can have gasoline, cleaning fluids, shoe polish, paints, antifreeze, razor blades . . . and lead miniatures. It's not the government's job to outlaw everything that could ever do harm. Especially when there's no popular vote, but just one political appointee in a New York office. If you live in New York State and want to protest this unfair bureaucratic snap-judgment, you can write to your state representative, state senator or the office of the governor. Letters to the Commissioner of Health are probably a waste of time, since this sort of office usually feels it's much wiser than the citizens and can ignore what they want. So . . . write to the people you elected! I have always envied Steve Jackson for his good fortune to edit a magazine devoted entirely to articles that he enjoys reading. It was my pleasure for these last two issues to step in and do the job that he finds so refreshing, but that time and circumstance have conspired to keep him from. Fortunately, I share Steve's love for GURPS, a game I played for four years before even considering applying for a job here – and which I still play weekly. I can honestly say that I have always believed GURPS to be the best game system in existence. It is a system that, while not requiring them, encourages modification and enhancement by its players, which is what Roleplayer is all about. The writers of these articles are not just professional writers; they are roleplayers, with a passion for the game. I know that passion will extend into the pages of Pyramid. And although I won't be editing Pyramid, I will have considerable influence on its direction and content, and I will bring my love for GURPS into that endeavor, full force. This issue marks the publication of something we've been trying to get into print for a while now: the revised mass combat rules for GURPS. Originally published in worldbooks like GURPS Conan, Japan and Vikings, these rules have been revised and expanded by Brett Slocum, whom I think has done an excellent job. Although it's generally not a good idea to take up half of an issue with one article, we felt this material was a good feature article for the final issue. When GURPS IV comes out, mass combat will get its own section. Illustrations: Donna Barr, Angela Bostick, Butch Burcham, Dan Carroll, John Hartwell, Topper Helmers, Sam Inabinet and Ruth Thompson. 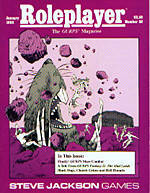 Roleplayer (ISSN 1050-3609) is published bimonthly by Steve Jackson Games Incorporated, PO Box 18957, Austin TX 78760. Roleplayer, AADA, Illuminati, GURPS, Autoduel and the all-seeing pyramid are registered trademarks of Steve Jackson Games Incorporated. Other product names mentioned herein are trademarks of Steve Jackson Games Incorporated or their respective publishers. Copyright © 1993 by Steve Jackson Games Incorporated. All rights reserved. Printed in the USA.